here's how you can help post-IRMA. While we think the work we do here at Radical Partners is rad, we'd like to steer your eyes right now to the recovery efforts being led by our friends and colleagues. Luckily, Miami dodged the worst of what Hurricane Irma could have been, but the storm still caused flooding, building damage, power outages, and emergency situations that are especially devastating for those who were already vulnerable. Fortunately, there are many groups and organizations, that will be handling immediate, short-term, and long-term relief efforts, to help the most affected Miamians. Donate to them. Volunteer with them. The American Red Cross specializes in being "second responders" on the ground after disasters. They focus on emergency response needs such as emergency shelter and mass feedings through partnerships. Their intention is not to do long term relief, but are able to show up fast and respond to massive need quickly. Learn more about their work with Hurricane Irma here. Bridge to Hope supports families in crisis by providing food and covering basic necessities. Hurricane Irma has elevated the volume of people seeking their support dramatically and they need immediate financial assistance to provide resources, food, and basic need-support to their constituents. During recovery, they will support families at or below the ALICE threshold with basic needs, cash assistance, development of community cooperatives for recovery, and rebuilding and technical training. In addition, volunteers who speak English, Spanish and Creole will be needed to support clients with insurance claims and legal advice. Camillus House implemented an Emergency Response Plan to equip a center that opened doors to people experiencing homelessness. Before and during the storm, they served an additional 229 individuals by providing housing, warm meals, changes of clothing, showers and additional campus amenities. Financial donations will help Camillus House cover the cost of these services. In addition, Camillus House is in need of gently used men and women's clothing, brand new men and women's socks and underwear, and toiletries, which can be dropped off at the Norwegian Cruise Line campus (1603 NW 7th Ave). The Center for Disaster Philanthropy is a resource to help donors make more thoughtful disaster-related giving decisions and maximize the impact of their gifts and donations. The Climate Resilience Team is a group of leaders (volunteers, community groups and grassroots) who are stepping up to ensure that no neighborhood gets left behind after evaluating the consequences of Hurricane Irma. They are providing access to critical services as early as possible, including healthcare, housing, transportation, legal representation and other services related to longer-term organizing. An updated list of needed supplies is available here. Participating organizations include: The New Florida Majority, Central Florida Jobs with Justice, Community Justice Project, Dream Defenders, Faith in Florida, Florida Immigrant Coalition, Florida Rights Restoration Coalition, FL Student Power, Make the Homeless Smile, Miami Worker’s Center, Manufactured Housing Action, Catalyst Miami, Organize Florida, SEIU, and WeCount!. Communities United is a Miami-Dade Program designed to assist all residents of Miami-Dade County who are affected by challenges resulting from post-natural disasters. The program works in Partnership with CORE (see below). Table of Brotherhood, a part of Communities United, is a disaster awareness team composed of faith-based organizations and social agencies that have united to provide support to the elderly. They provide food, care, medical services, and shelter, supported by the great work of volunteers. Community Justice Project is a group of community lawyers who collaborate closely with community organizers and grassroots groups in low-income communities to provide varied and often innovative legal work. They will provide support and expertise to the legal issues that may arise for many communities and individuals after the storm. CORE is a network of faith based, local and community organizations that provide food banks and emergency operations. Farmshare disseminates food, water, blankets and other resources to cover basic needs to 2000 churches and neighborhood based organizations across Florida. Farmshare is based in Homestead but has warehouses across the state. They need additional support post-Irma to help with the tremendous expense of moving food and water across the state to the people who need it most. Feeding South Florida is a domestic hunger relief organization focused on South Florida, with food banks serving Palm Beach, Broward, Miami-Dade, and Monroe Counties. Florida VOAD is a statewide body that facilitates cooperation, communication, coordination and collaboration of member organizations in all phases of disaster in order to maximize their impact. Goodwill of South Florida’s immediate goal is to help people with disabilities and other barriers to work get back to work as soon as possible and regain financial stability for hurricane recovery efforts. Goodwill South Florida has resumed it’s services, operations and Goodwill stores and donation centers in Miami and Broward. Cash Donations are needed to help Goodwill recover from the storm’s impact and will help move us past this difficult time. The Irma Response Network is a national and local network of tech savvy hackers, focused on responding to needs post-emergency. They created the www.irmaresponse.org tool, which maps shelters and community needs. Make the Homeless Smile Miami, led by CEO and Social Entrepreneurship Bootcamp alumni Valencia Gunder, is on the ground to help neighbors in need before, during and after Hurricane Irma. Learn more about Valencia and MTHSs' relief efforts here. 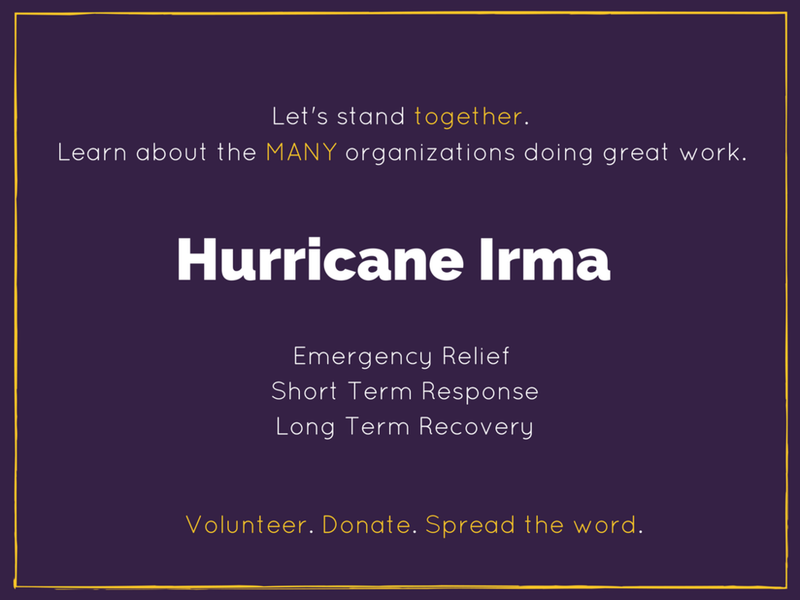 We know that poor and homeless communities are the most adversely affected by natural disasters - that is why MTHS is seeking your support to prepare for the aftermath of Irma. With your donations, Make the Homeless Smile Miami will be able to provide food, supplies and clothing for those impacted by Irma. For 25 years, Neighbors 4 Neighbors have responded to neighbors in crisis, and they will continue. At the moment, they are coordinating volunteers and connecting them to affected areas, in order to satisfy local needs and provide resources. As the recovery goes on long after the storm has gone, Neighbors 4 Neighbors will be there every step of the way. Rescue Warriors mobilized a group of veteran volunteers with boats, SUVs and rescue supplies ready to distribute supplies and donations. Salvation Army provides a variety of social services and support including supermarket vouchers, food pantries and baskets, emergency lodging and meals, utilities and rent assistance, household furnishing assistance, emergency inter-city transportation assistance, clothing, and shelter. They can also mobilize food trucks and showers for thousands of victims and first responders. The Hurricane Relief Fund will support recovery and rebuilding work driven by organizations on the ground. Click here to donate. Irma Caribbean Strong Relief Fund will support relief efforts in small Caribbean island nations and territories, including Antigua & Barbuda, U.S. Virgin Islands and the Bahamas. Click here to donate. Irma Community Recovery Fund will support relief efforts for Florida’s marginalized communities, ensuring residents in poverty have access to critical services and resources. Click here to donate. The Mission Continues 1st Platoon Miami organizes teams of veterans from across the country to tackle tough challenges facing their community as Mission Continues Service Platoons. They've been working in Miami since the Wednesday before Irma hit to minimize damages. They served 23 homes by putting up shutters, sandbags and plywood. Third Wave Volunteers jumps in to serve communities in need. They are currently fundraising for life sustaining supplies as well as SolarPuff solar lights for those who lost electricity and lighting. The United Way of Miami-Dade has activated Operation Helping Hands to mobilize donations and volunteer operations in the face of a regional emergency. United Way is focusing on recruiting, mobilizing and deploying volunteers to coordinate food and water delivery to shelters, and any other activities required after the emergency. Volunteer Florida is the official statewide volunteer corps that deploys statewide resources and volunteers in event of catastrophe. If you have been impacted by Hurricane Irma, you may be eligible for benefits and support. We love this guide from Community Justice Project that walks through the various benefits and how to apply. The Irma Response Network, spearheaded by the Open Referral Initiative and Open Miami, quickly mobilized the website www.irmaresponse.org to educate the community about emergency resources and register community needs. They also started a Slack channel to crowd-source solutions from over 600 civic hackers from the U.S. and abroad with the tech skills to develop useful tools hack solutions to community challenges. In collaboration with WLRN and The Miami Foundation they created an interactive map to help with hurricane recovery through a community-sourced list of resources and organizations including where to donate and volunteer. Facebook made available its safety-check tool, which allows users in emergencies to mark themselves as safe on their profiles and share other information. Gas Buddy is an an app that crowdsources prices at the pump, to figure out where fuel is still available.